Call Heath (205) 620-1818 Calera AL. Dirtworks and Bobcat Service created an outdoor living space underneath our customer's deck and next to his swimming pool. Previously it was dirt and rock and was an unusable area. We installed a patio made from pavers. We utilized a three piece random pattern. We dug into the hillside and installed a 45ft retaining wall with stairs. We removed 5 large trees to prepare the back yard for a new retaining wall. We excavated dirt from a lake wall to the new retaining wall and hauled off the excess dirt from the property. 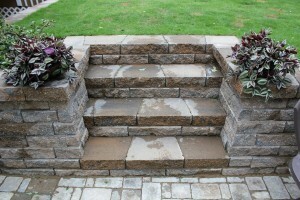 We installed 185' long and 4' tall retaining wall with one set of stairs in the middle of the wall. The retaining wall was back-filled with #57 crushed stone. We also installed a 4" drain on the inside-bottom of the wall. Landscaped backyard at Lay Lake, Alabama. 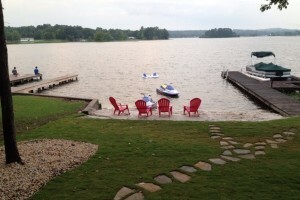 Dirtworks and Bobcat Service landscaped this lot at Lay Lake, Alabama. We used our Bobcat skid steer for grading. Pea gravel was installed around the trees and the trailer. Dirtworks also installed an irrigation system, a few pallets of sod and stepping stones. Our dump truck brought 22 tons of sand for the beach.